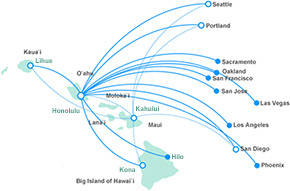 The Lihue (LIH) Airport is a short, 1-1/2 miles east of the town of Lihue. Lihue is located on the east-side of the island of Kauai and is a convenient airport location no matter where you’ve booked your lodgings. Rental car booths are just across the street from Baggage Claim. A shuttle that stops behind the booths will take you the short distance to your vehicle.